Since it's Halloween, I feel obligated to find an ugly designer bag and rip on it because.....well, just because. It would be simple to just find a usual suspect (like Fendi, Versace or Juicy Couture) and pick on it for all the obvious reasons, but I like the challenge of discovering a bag that should have been fabulous and got sidetracked. The Bottega Veneta Woven Boston Bag is a perfect example of what can happen when a trusted and error-free designer label "jumps the shark". The satchel's elegant shape and overall design is fine, but then we're hit with a myriad of woven strips clad in every imaginable color. 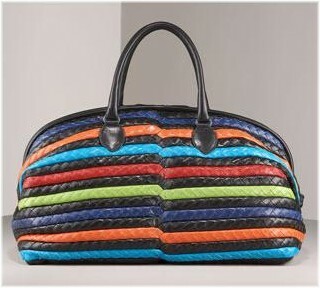 I can't figure out why this bag was ever made and especially by Bottega Veneta. What's even more egregious than the bag itself is the mind-numbing price tag - $5200! Say what? I wish this were a trick, because it's certainly not a treat. You can pre-order the Woven Boston Bag and receive it some time in March - just in time to use it as a colorful (and expensive) Easter basket.